There is so much to see in Rome. 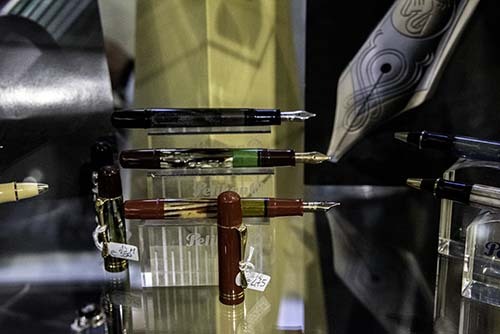 And, for a pen enthusiast one of the key things to do is take a visit to Novelli Pen. Novelli is a great pen store that carries both regular and limited edition pens from all the major brands. The store has been established for over 50 years and has a solid reputation. And I have been visiting the store since 1997 and I can speak very highly of the quality of sales and after sales service. I am also very pleased to say that on a regular basis I hear excellent reviews from those who have visited the store and dealt with Marco and his staff or completed a purchase through Novelli's website. It is very nice to hear from people who have visited the store, receive a warm reception, and found a pen that is right for them. 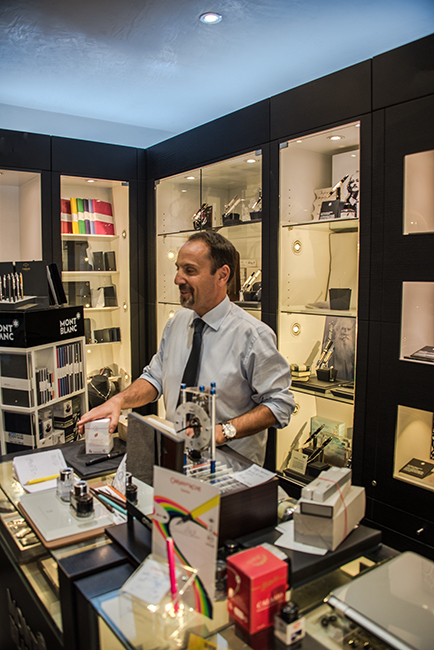 Marco and the staff, including Miki and Derek all speak English so for those who do not speak Italian, it is easy to talk about various pens and writing preferences. The store has show cases displaying the major lines of pens. There are some floor counters and a counter along the opposite wall. But I have found that if you don't see a particular pen then ask. 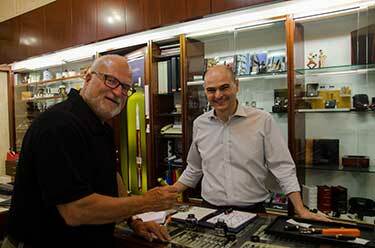 Right: Marco Parascenzo of Novelli pen, with Glenn Marcus on the 2016 vist. On my most recent visit in September 2016, as with previous visits, Marco enjoys bringing trays of pens from the back room. The selection will impress. What something other than the standard Medium or Fine nib. This is the place. If after viewing the pens in the store windows or showcases, if you do not see what you were thinking of, just ask. You will be impressed which what will be brought out. As I walk through the store looking at options, Marco would take a tray, and place any pen I was considering from the display case, and then we would go over to the counter when I could check the feel of of the pen in my hand, and dip the pen in some ink and see how it writes. The difficult part starts then, the elimination. But every year I have found a pen, in some years more than one, that I felt I must have as part of my collection. As I look at my collecftion, the response.... that came from Novelli... is a regular occurence. When travelling on holidays, one of the challenge is to get to a pen store. Novelli is centrally located. Just up from the large while Monument of Vittorio Emanuele II and between the Trevi Fountain and the Pantheon. 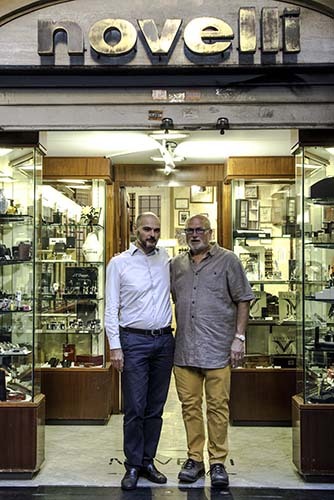 The store is located on a small street that runs parallel to Via del Corso, Via di San Marcello. For fun, on a previous trip when I was in Rome, on my way to Novelli, I shot a video of the walk from via delle Muratte, and then when you would turn left (if walking towards via Corso, and pass through the Galleria Sciarra on your way to the store. Video on tumblr. I have been going to Novelli pen for over 27 years. At left: Glenn and Marco at Novelli Pen & Pipe, June 2012. Glenn is trying out the Delta Re-Discover Pompei fountain pen. I think we are both looking younger! It started in 1997 that I enjoyed meeting Marco's father, Augusto Parascenzo. 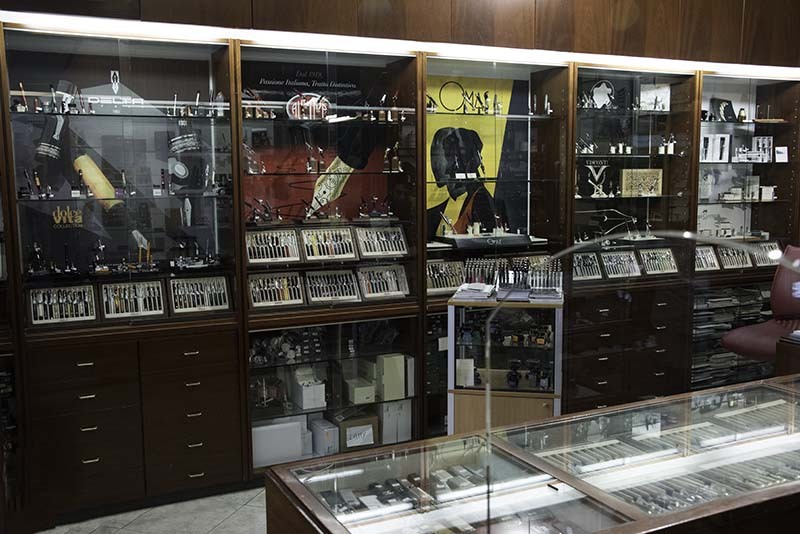 He showed his large collection of current, limited editions and vintage pens. We talked about pens and enjoyed a great lunch at a nearby restaurant. His wife, Giusy, trained by pen companies on the repair of pens , assists with any adjustments to a pen required. When Augusto passed away, Marco and his sister Sabrina continued with the business. Left: Derek King, second in the picture, has joined Marco at Novelli to help customers in selecting a pen right for them. My Waterman L'Etoile Limited Edition, Montegrappa Extra 1930 Parchment, Marble Green and Turtle Brown, Stipula Etruria, Omas Paragon in Saffron Blue, Omas Bologna Burkina, the new Omas Paragon, Arte Italiana Arco Celluloid, OMAS 360 Vintage Red, Vintage Teal, Delta Re-Discover Pompei and Delta 1982-2012 -- are all from Novelli. These pens are all part of my Pens of Note. Novelli offer to assist you with De-tax Forms which can help for those from outside the European Common market who purchase a pen and can get an adjustment on the VAT. Pick up a pen, and a bottle of ink is brought out, your pen is dipped and you can try it out. Left: Mikki has worked with Marco for a number of years and can help you with selecting a pen. I am always amazed at stores that watched me hold a pen and never bring out the ink to let me write with it. This, after all, is what the pen is all about. Plan your day. Novelli is open Monday to Friday from 9:00 am to 2:30 pm and from 4:00 pm to 7:30 pm. Saturday is is open from 10:00 am to 1:00 pm and 4:00 pm to 7:30 pm. Like many business in Italy, the store is closed for the month of August. Our our regular walks about Rome, I always take in a visit to Novelli Pen. 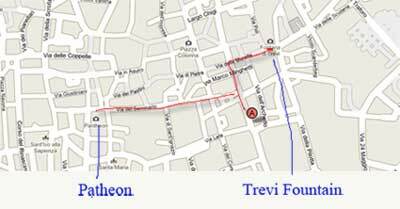 Luckily if walking from the Trevi Fountain towards the Pantheon or Piazza Navona, it is right on the way! From the Via del Corso which runs up from the Monument Vittorio Emanuelle II the store is located about three blocks up. Turn right on the small street (very small), Via Dell 'Umilta; first block in turn right again you are on via di San Marcello. 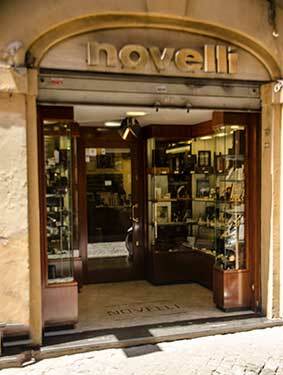 After visiting Novelli you are only three blocks from the Trevi Fountain, three or four blocks from the Pantheon. We always make it a Trevi Fountain, Novelli Pen, Pantheon and Piazza Navona walk! From the Trevi Fountain, on your way to walk towards the Pantheon or Piazza Novana: I always leave the Trevi fountain on the via delle Muratte. It is a pedestrian only street you can't miss is as it is the street that has the brown sign to point the way to the Piazza Navona or Pantheon. At the second left I turn on the Via di Santa Maria in Via. Keep walking down the street. You will walk through a beautiful galleria, an arcade and enter out into the via San Marcello. I have noted the two routes in red on the map below. Below is a live link to Google Map that will allow you to expand and explore the area. Click on the "Peg Guy" and you can see actual video of the street and can walk it from your computer! When we stayed in Rome on our 2017 visit we picked an apartment that was very close to Corsani. I would just pop down them if I needed some ink, a convertor and of course to visit. This is one of my "great pen stores" because of the selection pens and ink, the service and also their history. 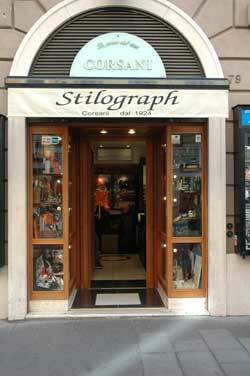 Corsani has been selling pens in Rome since 1924. I have met Stefano a few times and he told me how his grandfather started the store back in 1924 and it has been family run ever since. He has a wealth of knowledge about pens so do get any chance you have to drop by the store and visit. The store is located on Via Ottaviano, not far from St. Peter's Square. In 2017 we were staying in an apartment on Piazza Cavour. It is an easy walk. 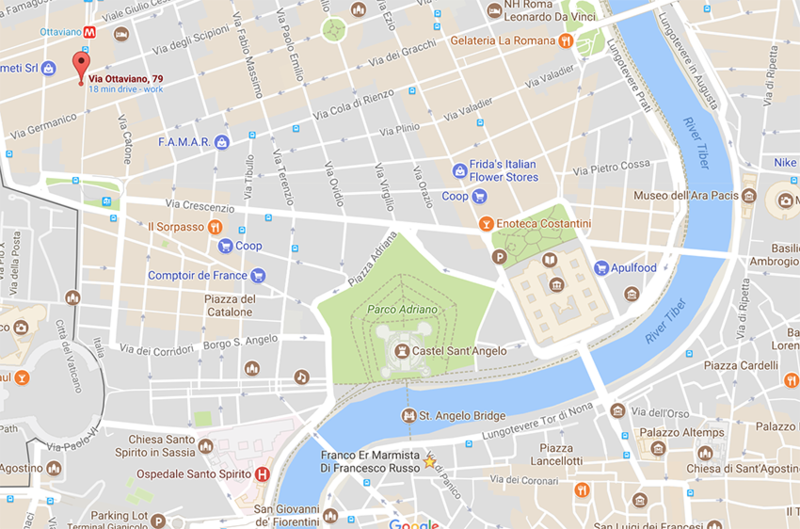 If you are near the Castello Sant'Angelo, just heard up towards and any of the main streets such as Via Crescenzio or Via Cola di Rienzo lead towards via Ottaviano. I think it was a 15 - 20 minute walk from the Corso Cavour which is very close to the Castel Sant'Angelo. While it first began as a book and stationery store, following World War II, Mario De Leo, the son of the founder dedicated the store to pens. The store carries a good selection of all pen lines as well as limited editions and a good selection of inks.. I am an honoured owner of one of Corsani's Limited Editions. 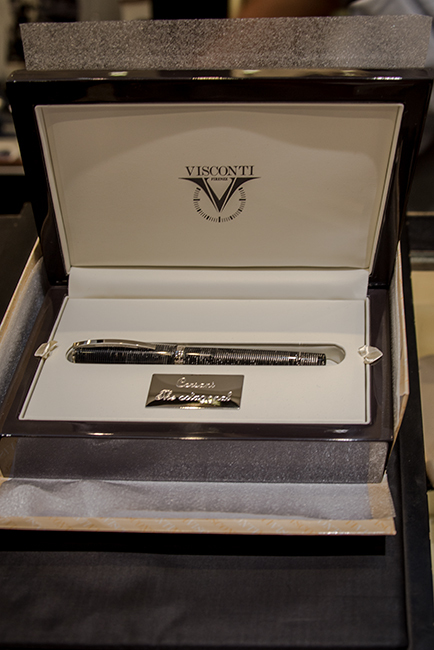 In 2016 I acquired the Visconti Corsani, a pen Stefano commissioned Visconti in2014 to create to celebrate the 90th anniversary of the store. More information on that pen is found under my Pens Of Note. 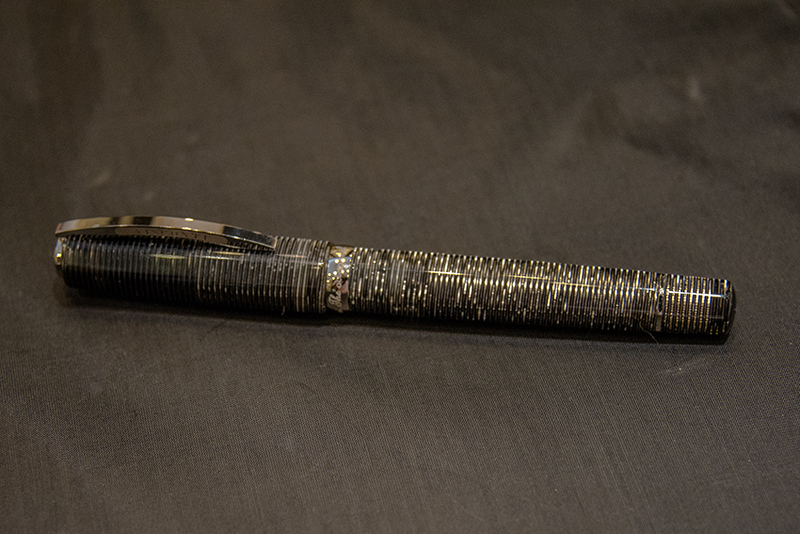 It is a beautiful celluloid pen using the black and grey/white streaks celluloid used in Visconti's Wall Street Series. This year, Stefano created another pen, the Corsani Octa90nal. This pen also uses the same celluloid at the previous Corsani 90th anniversary pen, but the body has eight sides so the pen has a different feel. Just as beautiful. You can walk, or take Metro Linea A, Ottaviano-S. Pietro station. The store is open Mondays from 10:00 to 7:30, and Tuesday to Saturday from 9:30 to 7:30. Say hi to Stephano. 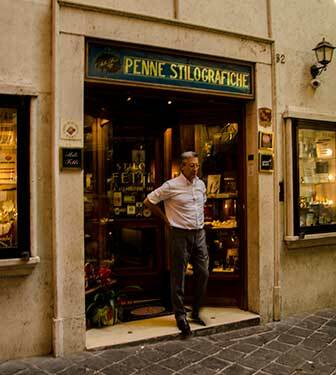 This is probably the oldest pen shop in Italy, having been established in 1893. It has been owned and operated by the Fetti family since then. On my September 2001 visit to Rome I went to the store. Great place! Located just off the Pantheon on the walk towards the Spanish Steps (take north east street leaving the Pantheon. On my 2010 visit to Rome I wanted to visit the store again, but it was a Monday and the store was closed. I dropped by again in 2012 and had a chance to meet the five generations of the family that run the business! You walk into the store and there are two large pen cases/counters... along the ways just about every inch has pens. There were two great large ink wells on the counters that I offered to buy! No luck! In the back room is a full selection of Mont Blanc pens as well as a range of brief cases and other desk accessories. On my visits I have found the staff to only speak Italian. On my 2010 visit I met with owner Corrado Rinaldi. He explained that the nature of their business has changed and they no longer carry the wider range of pen brands, but rather concentrate on Montblanc, Cartier and Dunhill pens along with the associated items produced by those companies. It is a beautiful store, but pen lines are limited to above. I have had a number of readers write me about Burchi & De Sanctis in Rome and I was pleased to visit their store again on a visit to Rome in 2007. On this visit I had an opportunity to speak with Carlo Cristiano. This is a long term company, with Burchi & De Sanctis being in business since 1914. 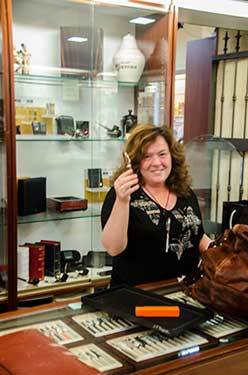 You will find this a well established store that specializes in pens, briefcases and other leather accessories. I have always found this shop to be stylish with a full range of pens and accessories. The store also carries a very good assortment of leather accessories. In fact, I still have the pen case that I purchased on my very first visit to the store. The staff were very friendly and they made me feel at home. The store is easy to find. It is located on via Frattina, just down from the Spanish Steps. Via Frattina has fashionable shops and an interesting street to walk... so you won't be dragging your partner down an uninteresting street while you proclaim "I know there is a pen store just ahead...". Comments on the store that I have received from others are also very positive. The store is open Monday to Saturday, from 10:00 in the morning until 7:30 in the evening. 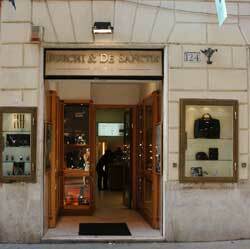 I did not get a chance to visit this store, located a few blocks from the Spanish Steps. But I am told there are actually two stores, side by side. One store is a stationery store with school supplies for children, and then adjacent store has a wide variety of fountain pens. Throughout Rome there are Tabac shops that will all have a couple of very nice pens in their windows. I have typically not listed these are pens stores as their selection is usually limited to one or two pens. This one, on my recent trip to Rome (September 2010) my wife Karen spotted and called me over. I remember looking in the window but then deciding not to explore further and we moved on. Well, I guess I should have spent a little more time looking around. Like many tabacs it is a very small shop, room for one or two people at the most. I got back, checked and read my e-mail only to be told by another pen enthusiast that he visited the tabac and found four or five cases of Visconti pens, Montblanc, Aurora and others all available.